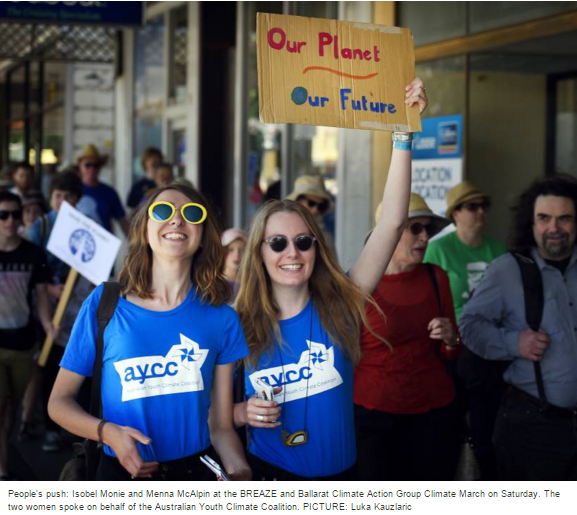 Nov. 28, 2015, 6:30 p.m.
Ballarat joined major cities all over the world by hosting a climate rally on the weekend. The Saturday-afternoon march from outside Town Hall to Camp Street brought over 150 people together to show their support for action on climate change. Prime Minister Malcolm Turnbull will travel to France on Sunday before the COP21 conference. The crowd was optimistic about change at the summit. Organiser Ian Rossiter, the president of BREAZE, said people were certainly hoping for a stronger approach to curbing emissions from the world leaders who will attend. “There was a groundswell of optimism (at the march),” he said. About a third of the crowd indicated they had travelled to Melbourne for Friday’s rally, which drew 60,000 people to the CBD. Irene Salmont, who came from Daylesford for the rally, said she was there because it was such a crucial fight. “It’s one of the most important issues, ever, really,” she said. Renée Ludekens agreed, saying Paris was a chance for countries to come together to do something. “We need confirmed lower emissions agreements,” she said. The last big climate change summit, in Copenhagen, ended without any major agreement, and the message coming from speakers on Saturday, including Buninyong MP Geoff Howard, was that limiting the damage from climate change was all an agreement could hope for. Deputy Mayor and Greens councillor Belinda Coates said the effects of a harsher climate were already being felt in Ballarat. “We’ve had the hottest in spring in 107 years...and the second driest ever,” she said. Cr Coates said it was also possible to make change on a city level, where she said much of the fight against climate change was happening. The crowd had assembled behind the Art Gallery of Ballarat on Camp Street for the speeches, and those applauding the strident calls for change ranged from the very young to the more experienced members of society. Mr Rossiter said extreme weather events had started to hit the big end of town, which is why he was confident Paris would see a binding agreement. Mr Turnbull has already pushed his climate change credentials before the summit, putting forward a declaration on the issue at the Commonwealth heads of government. “Ahead of COP21 it is a powerful signal to other countries of the world to show a similar level of ambition and commitment to working together for a strong result in Paris,” he said.